PanARMENIAN.Net - Community leaders and grassroots advocates from throughout the Eastern U.S. will gather to mark a year of progress and share plans for future successes at the 12th Annual Armenian National Committee of America-Eastern Region (ANCA-ER) Gala, to be held October 13 at the prestigious Grand Hyatt Hotel in New York City. 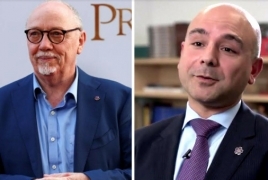 Armenian Genocide-era epic “The Promise” Director and Executive Producer Terry George and Eric Esrailian will be ANCA Eastern Region Freedom Award recipients this year, while tireless community advocate and educator Ken Sarajian will be honored with the Vahan Cardashian Award. This year’s gala will feature an elegant cocktail hour and silent auction followed by dinner and program. Individuals interested in purchasing tickets or to obtain individual or corporate sponsorship information, please visit https://ancaef.org/gala/ or call 201-788-5425. The ANCA-ER Freedom Award honors individuals who have succeeded in bringing the history of the Armenian people and the truth about the Armenian Genocide to the mainstream public consciousness. Terry George, recognized internationally for his groundbreaking film, “Hotel Rwanda” in 2004, and Eric Esrailian helped to fulfill the vision of the late Kirk Kerkorian, educating the public about the perseverance of the Armenian nation through the international blockbuster, “The Promise.” Though several obstacles were unleashed during production, the film went on to screen in the Vatican, the United States Capitol, various venues worldwide, and most recently, at the 2018 Smithsonian Folklife Festival. Previous ANCA-ER Freedom Award recipients include: U.S. Ambassador to Armenia John M. Evans; Pulitzer Prize winner author and former U.S. Ambassador to the United Nations, Samantha Power; U.S. Senator Robert Menendez; the late U.S. Senator Edward Kennedy; U.S. Senators Robert Dole and Elizabeth Dole; Baroness Caroline Cox; best-selling author Chris Bohjalian; renowned lawyer Robert Morgenthau and the Morgenthau family; Former House Majority Whip David Bonior; lawyer, writer, and human rights activist Fethiye Çetin; President of the Republic of Artsakh Bako Sahakyan; U.S. Senator Mark Kirk; U.S. Senator Christopher Van Hollen, Jr.; and U.S. Senator Ed Markey and Congresswoman Niki Tsongas. The Vahan Cardashian Award is given annually to an ANCA Eastern Region activist or supporter who demonstrates longstanding accomplishments on behalf of the Armenian Cause. The 2018 Cardashian Award recipient Ken Sarajian continues to work diligently within the Armenian community and in his chosen field of public education to promote civic activism and awareness. Along with building strong key Congressional relationships throughout the years, he, more recently, joined Shant Mardirossian at the New Jersey Council of Social Studies, educating teachers on the life-saving efforts of Near East Relief during the Armenian Genocide. Past recipients of the ANCA-ER Cardashian Award include Vahe Amirian of New Jersey; Martha Aramian of Rhode Island; Bedros Bandazian of Virginia; Melanie Kerneklian of Virginia; Tatul Sonentz-Papazian of Massachusetts; Ruth Thomasian of Massachusetts; Stephen Dulgarian of Massachusetts; Professor Richard Hovannisian of California; Zohrab Tazian of Indiana; Alice Movsesian of New Jersey; Armen Topouzian of Michigan; John Jerikian of Washington, DC; Levon Palian of Washington; DC, Tom Vartabedian (in memoriam) of Massachusetts; and Carolann Najarian of Boston, MA. The ANCA Eastern Region Endowment Fund is a 501(c)(3) charitable and educational organization that supports the Armenian National Committee of America Eastern Region in outreach to Armenian American communities. All contributions to the ANCA ER Endowment Fund are tax-deductible to the full extent allowable by law.